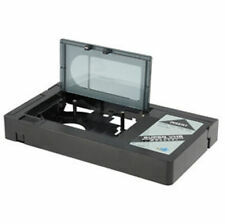 Adapter to record to or watch a VHS-C tape with a standard VHS video recorder. It takes a penlite battery to automatically open the front to load or unload a tape. • Watch your old video tapes again. Motorized, so tape loading and unloading is fast and easy. T his adapter will only work with vhs-c tapes, does NOT work for 8mm tapes. Gentle Dry Type Cleaner For Video 8, Digital 8, Hi8 & 8mm Camcorders. 8mm Camcorder Cleaning Tape / Cassette. At the end of the tape just rewind and start the process again. Suitable for many cleaning sessions. SONY are one of the top tape manufacturers and design their tapes to give excellent. Brilliant Results from standard definition camcorders, and will also record. digital picture quality with vibrant colours and superb sound in both 'SP' & 'LP' mode. 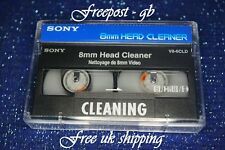 Sony MINI DV Camcorder Cleaning Cassette - DVM-4CLD. Genuine Sony Mini DV Head Cleaner. and thus increase the picture quality and the life of your expensive camcorder. Sony MiniDV Premium Tape - 60 minute length. Perfect digital picture with a resolution that exceeds 500 lines. Thickness : total (µm). Cancelling before you have received your order. Cancelling after you have received your order. National Panasonic MINI DV Camcorder Cleaning Cassette - AY-DVMCLC. Genuine Panasonic Mini DV Head Cleaner. and thus increase the picture quality and the life of your expensive camcorder. Panasonic mini DV PQ tape is an excellent choice for professional videographers. Professional mini DV tape. With the new process, it is now possible to improve magnetic density over 400%. This provides a highly durable DVCAM format videotape specifically designed for professional HDV recording. High durability and high tolerance of DVCAM tape are expanded for professional HDV. The triple benefit of high output/low noise, low dropout and high durability, provided by Sony's Diamond Like Carbon (DLC) protective layer technology, accounts for the tape's low error rate, resulting in consistently high picture quality. Panasonic DVC Mini DV Digital Video Head Cleaner Tape. Digital Video Dry Head Cleaner. We will hand select the best box condition out of our inventories. Box condition is sold as is. Other Animation. New and sealed - see photos. DVCAM format: 124 minutes. Manufacturer: Sony. Quantity: 10. Amplified Active Indoor Antenna Aerial AM FM Stereo Radio. Audio & Video. AV Cable - Canon. AV Cable - Fuji. AV Cable - Kodak. AV Cable - Minolta. AV Cable - Nikon. AV Cable - Olympus. Genuine Panasonic DVM60 Mini DV Tapes. Also works really well with Hi-Def Mini DV Camcorders. The Tapes are designed to run for 60 minutes on 'SP' or 90 Minutes on 'LP'. 11x Job Lot FujiFilm DVCAM DV131 40 Advanced ME Video Cassette - NEW. Hi 8 Tape Quality: Digital 8. Playing Length in Minutes: 120. Play length (minutes): 120. Beautiful Retro JVC GR-65 VideoMovie Camcorder in great working condition. Camcorder and 2 Batteries. Full Original Instructions and related paperwork. 2 original Cases. However I have not tried recording anything as I do not have a cassette to go in and didn't want to open and use one of the new ones. NEW FACTORY SEALED MOTORIZED VHS-C ADAPTER. Cassette Size VHS-C. CONTINENTAL USA. Opened box but tapes are still factory sealed. SONY PDVM-64N/3 DVCAM HDV/DV Professional Video Cassette Tape job new BOX OF 9. We have everything tested and checked before being advertised for sale. Supplied as pictured. We will be responsible for all the loss. 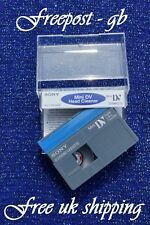 SONY PDVM-22N/3 DVCAM HDV/DV Professional Video Cassette Tape job new BOX OF 10. We have everything tested and checked before being advertised for sale. We will be responsible for all the loss. Supplied as pictured. Type: Mini DV. Carbon coated for added durability. Tape grade: Linear plus. Professional Standard InTapes. Low Error Rates. Bringing you exceptional picture quality, great resistance and excellent value for money. Perfect digital picture with a resolution that exceeds 500 lines. Possibility to record up to 50% more in LP mode. The DVM-63HD features 90% fewer errors and 50% fewer dropouts compared to DV Reference tape (tested on standard Sony DV VCR). Independent film makers, advertising agencies, and other videographers will appreciate the improved image quality, and the professional 63 minute tape duration. In addition to providing HDV1080i recording and playback, the HVR-M15E also supports both DVCAM and DV formats providing users the ability to work with both standard definition and high definition content. About the item: This item is associated with the following MPN(s): HMD1GL. WE WILL BE HAPPY TO WORK OUT ANY PROBLEMS/ISSUES RELATING TO YOUR ORDER. Product Details. Verbatim Digital Video Cassette's are for use with Mini Digital Video (DV) Camcorders. Verbatim: #47653 0711-79. 60 minutes SP Mode; 90 minutes LP Mode. These cassettes enable 60 minutes of high quality recording and feature an anti-static lid for error free recording. HDCAMSR EVALUATED VIDEO TAPE. sold in boxes of 10 £40 per box. ALL TAPES SOLD ARE CERTIFIED B GRADE. B grade tapes -sold with labels. out of uk is £17 per box. Sony PHU-120R 120GB Professional Hard Disk Unit. The new Sony PHU-120R hard disk drive enhances the efficicency of the XDCAM EX even further with two improved 60GB in one 120GB hard disk unit. This results in very stable data transfer during long recordings. This Sony Hi8 videocassette has the ability to capture your images using analog or digital technology. 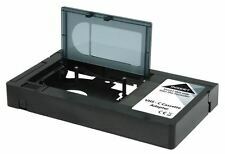 This videocassette can be used with your Hi8 or digital camcorder.On a Hi8 camcorder, this videocassette can record up to 60 minutes in SP mode or 120 minutes in LP mode. Fast and free UK shipping 10x JVC DVM60 Mini Digital Video Cassette Tapes Pack 60 Minute Sealed Bundle Lot This listing is for 10 x unopened brand new and sealed JVC DV M60 mini digital video cassettes These cassettes are 60 minute blank DV cassettes Please check photos for condition and what you will receive. 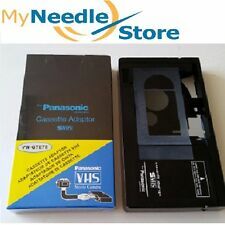 You will get: 10 x digital video cassettes (60 minute each cassette) new and and sealed A secure shipping service will be used Please check out my other eBay listings. Exabyte took the 8 mm video format and made it suitable for data storage. We have used these tapes to record and playbck in both Hi8 and Digital8 camcorders with no problems. This Maxell Cassette will only work with 8mm Video8 camcorders. Capacity up to 2.8 GB. 120 minutes recording in Long Play mode / 60 minutes recording in Standard mode / 40 minutes recording in High-quality mode. - Compact and easy to carry?. for sharing with friends, family and colleagues. Has been cleaned and all content has been deleted/blank tape. ready to be used again only been run twice max. VHS-C Camcorder Tapes / Cassettes. Close the door and place the whole adaptor into your video recorder. CAMCORDER TAPES IN A VHS VIDEO. Very Simple to use - open the door and pop in your VHS-C camcorder cassette. HDCAM Sony 32 minA grade evaluated tapes. This sale is for a box of 10x new Panasonic DVCPRO 66L Large Format Camcorder Tape AJ-P66LP as seen in the pictures. The DVCPRO cassette tape also boasts excellent tape transport stability and outstanding durability. 20x Fujifilm Mini DV Cassettes.